You are here: Home / News & Events / Foundation / Santa, donuts and bacon. Oh my! Santa made a stop in the Mahoning Valley for the Annual Breakfast with Santa event. 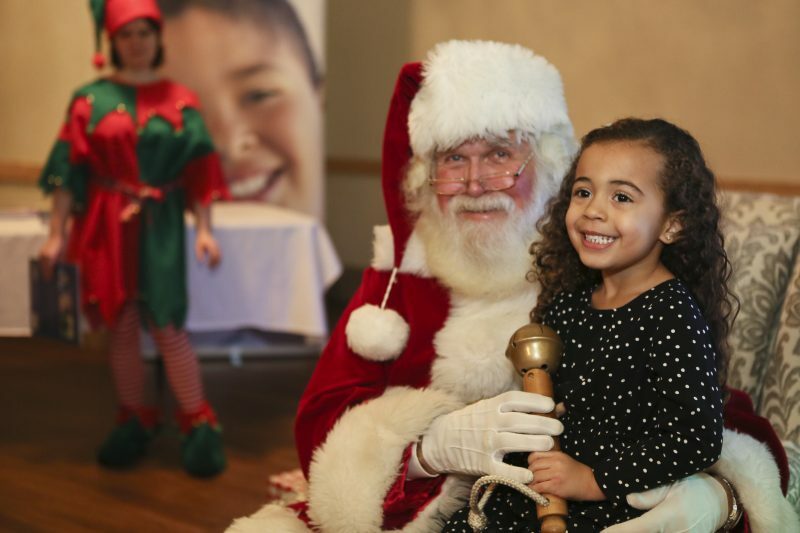 It’s a lively, music-filled, child-friendly, party-like atmosphere to kick off the holiday season for many families, but at this Breakfast with Santa event it’s hard to determine who’s having more fun – the kids or the adults! “We come every year. We just love it!” said Nikkie Krut of Ellsworth. She brought seven kids with her this year, including two of her own. Nearly 500 people in all attended this year. The Georgetown in Boardman was abuzz with children, parents and grandparents soaking in a parade of popular local mascot characters, catching photo opps with Disney princesses and superheroes, requesting balloon animals from clowns, showing off their dance moves, and of course bending the ear of Santa Claus himself. Proceeds from the event directly support programs and services at Akron Children’s Hospital Mahoning Valley. Stock estimated between ticket sales, the chance auction and generous sponsor support the event will raise more than $25,000. Sharon Hrina, MSN, RN, vice president of Akron Children’s Hospital Mahoning Valley, greeted families and watched in delight at everyone enjoying their time. Sharon Hrina, MSN, vice president, Akron Children’s Hospital Mahoning Valley and JoAnn Stock, senior director of development, accept a check for $29,000 from Dunkin’ Donuts. A representative from Dunkin’ Donuts, one of the event sponsors, presented a check to Akron Children’s Hospital Mahoning Valley for $29,000 from its annual Miracles for Munchkins program.